Grenfell Tower is a derelict 24-storey residential tower block in North Kensington, London. Its remains still stand after a severe fire broke out on June 14th 2017 which is said to have killed 72 people. I parrot Wikipedia to begin, because it’s difficult knowing where to start with Grenfell. It’s a monster of a subject, especially as an outsider, someone who doesn’t know a large amount about it, someone who doesn’t live anywhere near London or know the specific area. But when I decided to spend a day in the capital just before Christmas, it was an area I wanted to see. This was a place where something horrifying and socially profound had occurred, a major social disaster of our age, possibly of my lifetime. The bleak story sounds like one from several centuries ago. It seems incomprehensible that such a thing could have happened in modern Britain, in London, in the year 2017. The countless stories of lost life are heartbreaking. From babies and children to families and elderly single people, a whole swathe of humans experienced terrifying deaths. More than half of them were told to stay where they were, and assured that help was coming. They are said to have believed that an emergency airlift was possible. A number of formal proceedings are ongoing and the ripple effect will hopefully be a long term force for good, ensuring that nothing like this can ever happen again. Most prominent is the public inquiry, set in motion in August 2017. Phase One of the Grenfell Tower Inquiry sought to establish the detail of what occurred and Phase Two, which is currently underway, will concentrate on the circumstances and decisions made. More information can be found on the inquiry website: https://www.grenfelltowerinquiry.org.uk. It’s not obvious how to access detail on the future timeline, so it’s unclear what happens next, how many phases there will be, or how or when the inquiry is intended to conclude. A report by the commission on social housing and convened by the charity Shelter has taken up a number of proposals put forward by the disaster’s survivors and there has been an indication that the government is engaged. Proposals for a new system of regulation in England are expected later in 2019. For all such efforts there is likely to be a parallel untrusting narrative which is dismissive of formal process and speaks of conspiracy and cover-ups, as can be seen around the tower. Trust levels in government are understandably low. But this is also perhaps a common modern symptom of deeply complex, multi-faceted issues with countless shades of grey and multiple interpretations. In previous internet-free generations politicians arguably handled this much better than they do now. We want difficult subjects to be categorised simply. We want brevity, headlines, tweets, and a two minute report if you really must. We don’t want text-packed colourless websites full of achingly long PDF documents. While the British social equivalent of 9/11 has left a gaping scar that remains visibly raw in the local environment, it feels all too easily forgotten outside the M25 and across the wider reaches of Britain. It’s an awful thing that happened and we have moved on from it, as we must, as we do, like any shocking accidents, air disasters, terrorist attacks in London or at the Manchester Arena. This is to be expected. If you are unlucky enough to be caught up in such an event, the impact will be huge. It will become part of you and may even shape your whole identity. Whereas if you are some distance removed, it won’t. Anniversaries will be marked, ceremonies held, respects paid, perhaps updated stories of victims will be broadcast. You can acknowledge it and take a moment to reflect. But that will be it. We currently live in a period of months and years dominated by Brexit. There is widespread unrest and nervousness. Decades from now, when reflecting on this skittish period, you fear the atrocity of Grenfell Tower won’t be afforded the attention it deserves. You fear it could pale or become diluted, despite being utterly horrific. (Click on these images to enlarge and read the handwriting more easily). Corporate manslaughter, greed and corruption, gross negligence: these are the words being used and the accusations being made, and detail on the Wikipedia page about fire safety concerns well before the fire are chilling. Grenfell Action Group (GAG) in the last four years published 10 warnings criticising fire safety and maintenance practices at Grenfell Tower. In 2013, the group published a 2012 fire risk assessment done by a TMO Health and Safety Officer which recorded safety concerns. Firefighting equipment at the tower had not been checked for up to four years; on-site fire extinguishers had expired, and some had the word “condemned” written on them because they were so old. GAG documented its attempts to contact KCTMO management; they also alerted the council Cabinet Member for Housing and Property but said they never received a reply from him or his deputy. In an easily distracted Conservative Britain many may question if time will pale these events and the most senior figures responsible will ultimately be able to squirm away, retire or die. Will there be substantial punishment and prosecution, or will it merely be fines and reputations on the line? Perhaps only eighteen months on, it’s still too soon to say. The 1989 Hillsborough Stadium disaster and its continuing legal action indicates how these things can stretch on for decades. Maintaining pressure, keeping it relevant and visible in the wider media landscape, that will always be a challenge. But there is evidently the will. What is clear is the long lasting practical day-to-day impact on survivors. It was recently reported that almost 100 families made homeless by the fire were still without a home at Christmas 2018. Surely there are many with long term health issues. You can’t help but wonder at the long term psychological damage: PTSD of survivors, those who escaped, of fire fighters, or even those safely outside the tower throughout, who could only stand and watch as the whole horrible scene unfolded, thinking about family, friends or familiar strangers trapped inside. Those people must number in the hundreds. As well as seeing it with my own eyes, eighteen months on, naturally I wanted to photograph what it looks like now. I felt compelled to document the urban artworks, the shrines, the words and feelings of locals who knew the dead and what happened much better than anyone else. These are the people who continue to go through the trauma. There weren’t many people around as I aimlessly roamed the streets around the tower on a bright Wednesday morning in mid December 2018. But you could still feel an emotional rawness, creativity and pride in the local neighbourhood. In the jagged technicolour urban spaces and uniform blocky right angles and terraces, there’s an unmistakeable imprint of authentic character about the environment, a sense that the hybrid mix of residences is united in its own way. 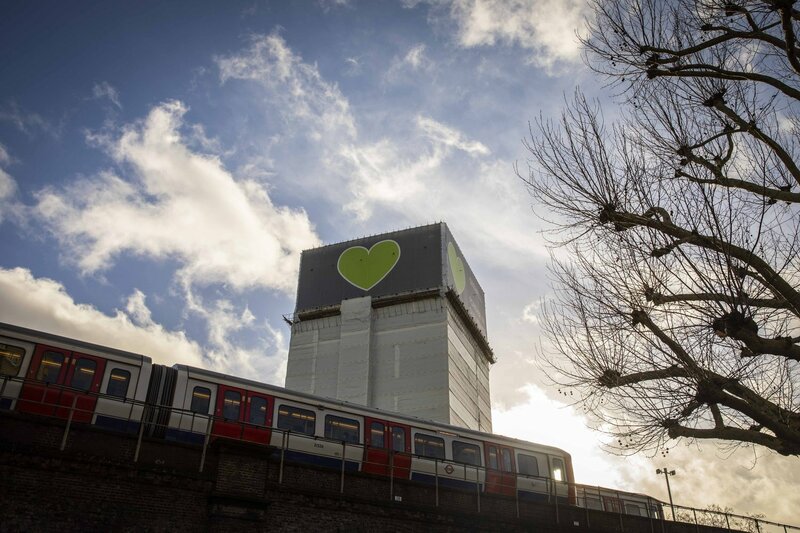 There are urban monuments, underpasses with colourful artworks containing handwritten accounts, talk of conspiracy theories and cover-ups, corners of residential buildings have tributes to people who died, soft toys, posters in windows, all overlooked by the looming wrapped-up Grenfell Tower, adorned with a green heart and the words “Grenfell – Forever In Our Hearts”. Together it forms a blitz of powerful and impassioned messages which are impossible to avoid as an outsider. Although if you live in and around it every day, maybe it becomes part of the scenery and you don’t register it as much. While I was reading the walls here a man who I supposed was local cycled up to this colourful piano, played a short jaunty, optimistic sounding song, then went on his way. It appeared a habitual thing. I regret not trying to engage him, asking to take his photograph, chatting with him.